"Looking at it today, no one would guess that the little pocket park at Barclay and Birkwood Streets was once a vacant paved lot of little use to local residents. Beneath the cover of green grass and many spring flowering trees, it's hard to believe there still lies a hard asphalt surface." Over forty years earlier, on December 18, 1945, a small group of residents established the University-Birkwood Association, Inc. paid George A. Cook, a local builder and developer, and his wife Jeannette five dollars for the oddly shaped lot. The property came with a catch—the Association was prohibited from building any structure on the lot for twenty years. Instead, they turned the vacant land into a profitable investment by paving it over with asphalt and charging people who worked nearby to park their cars. The original agreement against building on the lot expired in 1965 but, by the early 1970s, members of the association had a different approach in mind. In April 1971, the Waverly Branch of the Enoch Pratt Free Library had moved from a small building at 1443 Gorsuch Avenue to a modern cast-concrete structure at the corner of E. 33rd and Barclay Streets. The library was located on the former site of the BellTel building and, unfortunately for the University-Birkwood Association, Bell System employees had made up a large share of the paying customers for their parking lot. In 1974, the Association's board of directors decided that the lot could better serve the neighborhood in a new way—and voted to convert the parking lot into "green space." Limited funds for the new open space (and the uncertain prospect of paying property taxes on the lot without no revenue from parking fees) encouraged a creative approach. The Association sold shares to neighborhood residents interested in supporting the planned improvements. Proceeds went to purchase trees, bulbs, grass seed, and fertilizer. Between 1975 and 1978, members dug over thirty holes through the old asphalt to make room for new trees and flower beds. Association shareholders and volunteers spread mulch and seeded the ground creating a verdant lawn still enjoyed by local children. People walking or driving past likely enjoyed the springtime view when, according to the 1987 contest nomination, "daffodils bloom on the bank along Barclay Street and the flowering cherry and plum trees burst into color." Throughout the 1980s and early 1990s, around twenty households participated in the University-Birkwood Association's efforts to maintain the lot by pruning, weeding, and mulching during "work days" each spring and fall—and spending countless hours every summer helping with mowing the grass. “The Oakenshawe Green Space is the neighbors,” explained Laurie Feinberg. Feinberg, an Oakenshawe resident since 1987, gained a new appreciation for the green space after having children in 1991, recalling, "There is a whole generation of kids that essentially grew up playing the green space." 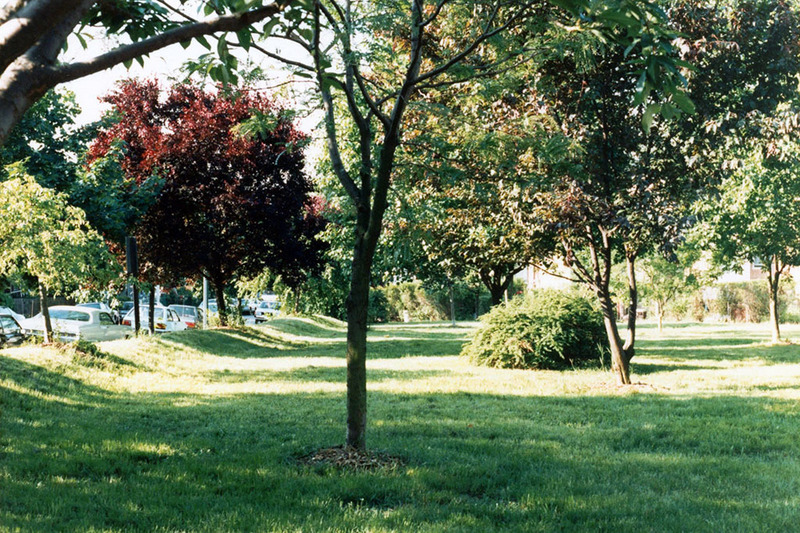 In August 1993, the Association board converted the corporation into a new nonprofit organization—Oakenshaw Greenspace, Inc. 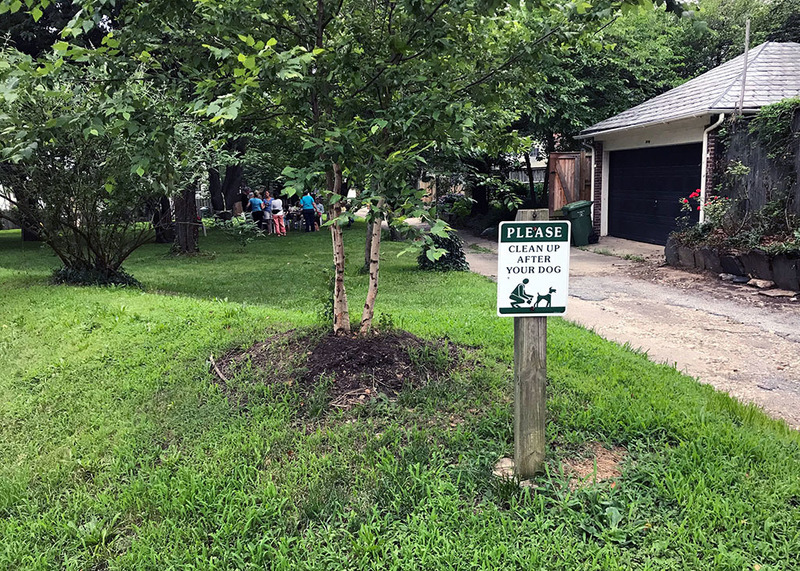 Beyond the day-to-day tasks of cleaning up litter and dog waste, the group won a grant from the Parks & People Foundation to bulldoze parts of the original parking lot and replace the old asphalt with more grass. 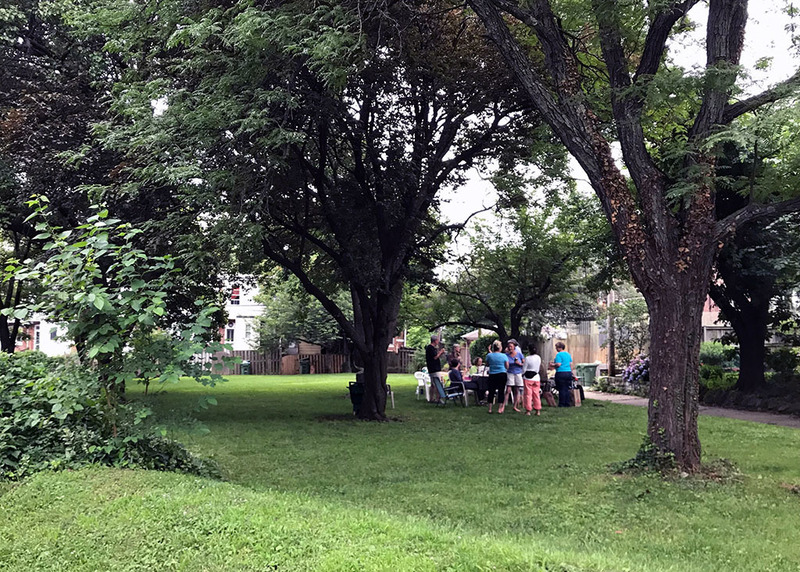 In early 2018, the group decided to donate the property to Baltimore Greenspace—an environmental land trust dedicated to preserving communities’ open spaces and forest patches as spaces for recreation, civic engagement, and community revitalization. At forty-four years old, the Oakenshaw Green Space is the oldest of any of the properties donated to the land trust in their ten-year history. Fortunately, the donation ensures that neighbors can expect many more years of trees, flowers, and community gatherings on Barclay Street. 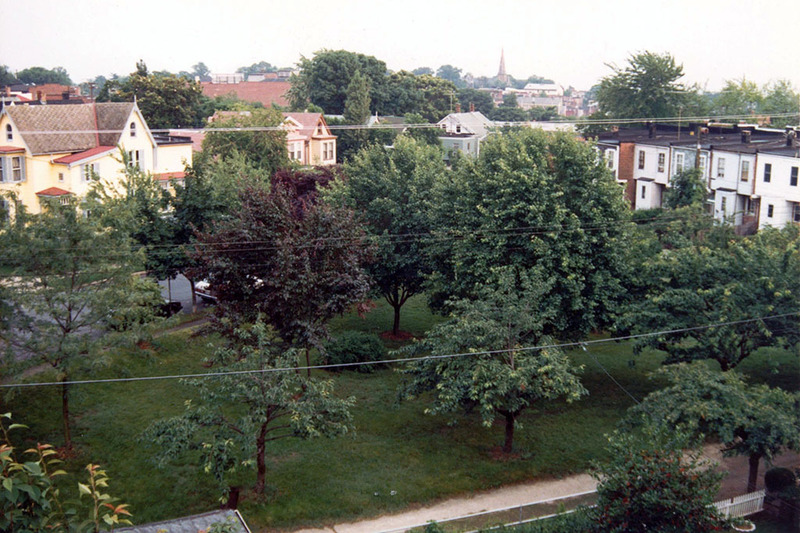 Eli Pousson, “Oakenshawe Green Space,” Explore Baltimore Heritage, accessed April 23, 2019, https://explore.baltimoreheritage.org/items/show/654. Published on Jul 3, 2018. Last updated on Nov 27, 2018.